2019 Audi E-Tron equipped with toll-payment module | Car News, Reviews, & Pricing for New & Used Cars. When the battery-electric Audi E-Tron crossover arrives early next year, it will be the first vehicle from the brand to feature an electronic toll-payment transponder integrated in the rearview mirror. Audi says the transponder module, which is standard, will allow drivers to access select toll roads in the U.S. and Canada, eliminate the need to manage multiple toll accounts and decrease windscreen clutter, since most toll-road transponders today are devices that mount to the windshield or top of the dashboard. Drivers can adjust settings, turn the module on and off, and change the occupant settings for high-occupancy vehicle or high-occupancy toll lanes through Audi’s Multi Media Interface system. The module was developed by Gentex Corp., the Zeeland, Mich.-based auto supplier best known for making auto-dimming rearview mirrors. Audi says the technology is compatible with existing toll systems nationwide and can be registered with a current account, new account or nationwide tolling account. The E-Tron is the first of three electric vehicles the German brand plans to debut by 2020. It features unique virtual side mirrors, which can be adjusted via a touchscreen for highways, street corners and parking, and zoomed in and out of. Last month we learned that the E-Tron’s dual motors will make a combined 355 horsepower and 414 pound-feet of torque, and 402 hp and 490 lb-ft in high-power mode. 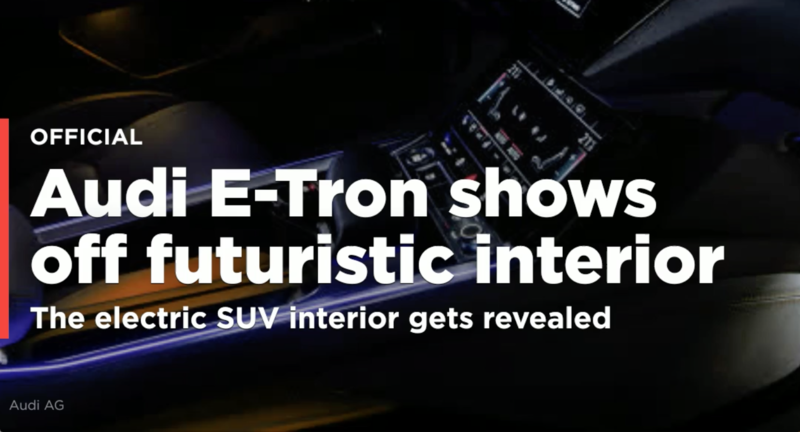 The E-Tron is expected to be priced in-between the roughly $70,000 Jaguar I-Pace and the nearly $80,000 Tesla Model X, and we should know specifics very soon. It makes it global debut in San Francisco on Sept. 17, which is also the date when Audi starts accepting orders for deliveries in early 2019, via a refundable $1,000 reservation.